THE GALAXY EXPRESS: Interview with TSUNAMI BLUE Author Gayle Ann Williams & A Giveaway! Interview with TSUNAMI BLUE Author Gayle Ann Williams & A Giveaway! This month marks the release for the post-apocalyptic romance TSUNAMI BLUE (Dorchester) by Gayle Ann Williams! Every day a science fiction romance is released is a good day, eh? Recently, RT Book Reviews awarded TSUNAMI BLUE 4 1/2 Stars—you go, Ms. Williams! To help celebrate the book’s release, Ms. Williams will give away a print copy of her book to two lucky passengers. With her badass rain boots, her faithful dog, and the ability to predict the monster tsunamis that have reduced the US to a series of islands, Kathryn O’Malley isn’t afraid of much. Cut off from all society, she takes to the airwaves as Tsunami Blue, hoping to save something of humanity as the world around her crumbles. But Blue should be afraid—because her message reaches the wrong ears. Now she’s the target of ruthless pirates known as Runners who want to use her special talents for their own profiteering—as soon as they can find her. 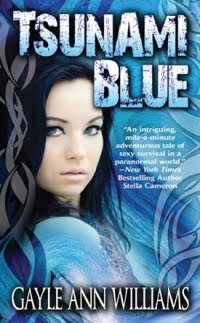 Blue’s only shot at survival lies with the naked stranger who washes up on her rocky beach. A man who might just be working for Runners himself. Torn between suspicion and attraction, the two will have to navigate a surging tide of danger and deceit if they hope to stay alive. Before we proceed with the giveaway, I’m delighted to share an interview I conducted with Gayle Ann Williams about her debut book. The author has been with us previously—in Throw That Novel Into The Ring!, the author revisited her path to publication during a guest blog here at The Galaxy Express. You can read more about her journey in her recent guest post at Emily Bryan's blog as well as her piece Write What You Know--And Also, What You Don't at Dorchester's site. Now, read on for an in-depth look at the author and her work, including what she means by the three “P’s,” the inside scoop on her raging [censored] addiction, and what exactly William Shatner and Leonard Nimoy did to make her cry. TGE: What was the inspiration for TSUNAMI BLUE? What attracted you to a post-apocalyptic setting? Gayle Ann Williams: On Christmas night, in 2004 I boarded a plane out of Seattle and flew right into the Southeast Asian Tsunami. In the air when the deadly wave hit, I knew that if I had arrived earlier, I might have been a statistic. As I traveled around the region, I listened and observed, hugged and cried, and all along, the writer in me asked, what if? I did not know this at the time, but this experience, this life changing adventure, would become the very foundation for my book, TSUNAMI BLUE. And on the appeal of a post-apocalyptic world? There is only one answer for me. The first time I saw this 1979 Australian dystopian movie, it was on a funky TV, with bad reception, which had to add to an already gritty experience. Dialing in the tube, I zeroed in on a movie simply titled “MAD MAX.” I had never seen anything like it. And the rest as they say is history. A post-apocalyptic world grabbed my imagination that night, and never let go. TGE: What’s unique about your heroine Kathryn “Blue” O’Malley and hero Gabriel Black? GAW: What I most love about Blue, is her vulnerability. What makes her unique is that she is a young woman of extreme contrasts. She is both naive and innocent, a victim of her isolation, and yet at the same time, she is dangerous with a “kill or be killed” instinct. An instinct she had to use for the first time at the age of thirteen. But through it all, she desperately fights to hold on to her humanity, to do what is right. And I admire her for that. Gabriel Black is an enigma. Brave, loyal, fierce. He will fight to the death to protect the people he loves. And yet he travels with the brutal Runners. Still, he has held on to his humanity, when in reality he would be much better off to just take what he needs to survive and to hell with the rest. But he doesn’t. Why? Is he a protector? An opportunist? Is he good? Evil? Or somewhere in between? And he certainly makes his mistakes. . .especially with Blue. TGE: Please describe some of the differences between “Runners” and traditional pirates. The Runners of my post-apocalyptic world are nothing like the pirates of old. They have no code, no loyalties, no boundaries, and most have no soul. The Runners in TSUNAMI BLUE survive only for themselves, and not for each other. There is no true “brotherhood,” although they would like you to believe there is. TGE: What are some of your favorite science fiction romance books/films/television shows? GAW: Oh Heather, lol. Too many to name. But I loved the HANDMAID’S TALE, and can’t tell you how many times I’ve revisited DUNE. I’m old school STAR TREK, and when I saw William Shatner and Leonard Nimoy take the stage at a convention in Seattle, years ago, I cried. I know, lol. BLADE RUNNER is one of my all time favorites, and of course films like ESCAPE FROM NEW YORK and TOTAL RECALL are on my list. And we do have amazingly talented authors like Ann Aguirre (The JAX SERIES ) and Susan Grant (The STAR TRILOGY) writing great stories in this genre. On a personal note, my favorite science fiction story of all time (and I know I’m not alone here) is, "I HAVE NO MOUTH, AND I MUST SCREAM," by Harlan Ellison. This post-apocalyptic tale is one I will never, ever forget. TGE: Texas Hold'em is probably one of the coolest names for a poker game, ever. Just in case I find myself playing against a band of ruthless runners, what are some strategies I should use? GAW: First, Heather? Show. No. Fear. Poker players, um, I mean Runners, can smell fear from miles away. And to coin a poker term, you then become a “fish” and they become the “sharks.” This is never good. Second I would tell you to use what I call the three “P’s.” Patience, position and practice. Runners are not known for their patience, in fact, they have none. Wait them out. They will play most anything, and you can take them down with your strong hand. Second, wait until you are last to act, in late position, and pounce with your all-in move. And lastly, practice. Blue grew up playing poker, she could read people, calculate odds, spot a cheat. But nothing, and I mean nothing, beats your ability to run fast. Because after all, Runners tend to be very sore losers. TGE: What was the most challenging aspect of writing TSUNAMI BLUE? The most enjoyable? GAW: I loved writing TSUNAMI BLUE, every word, and I hope that shows up in my novel. It was such a challenging, interesting world to create and such fun to write in first person. Through the narrative, I felt close to the characters and telling the story through Blue’s eyes, the way she viewed the world, what she perceived was her “truth” was a great experience. But there were challenges. How to keep the story moving and interesting? How to make you the reader, love my characters as much as I did? I worked hard on these elements, and I hope I succeeded. TGE: In your bio, you describe your love of espresso. Do you have a favorite brand? Please share three of your favorite espresso drinks. GAW: Ah, espresso. How I love thee! I live on a small island in the rainy, Pacific Northwest. We have wonderful coffee here on the island, and of course, Seattle, the city that is the home of Starbucks and Seattle’s Best Coffee, is just a ferry boat ride away. My favorite espresso drink is a double short breve. Served in an eight ounce cup, it consists of two shots of a dark roasted blend and heavy cream or half and half. Rich, creamy, and packed full of calories, it is my winter drink. During the summer I drink double Americanos. Again two shots (dark roast) with a one, two, three, count of cream. Americanos are great over ice. And lastly, just two straight shots of espresso with a splash of cream. Fast, strong, and guaranteed to get me going. And I never use a sweetener of any kind. Addicted you say? Yep, pretty much. TGE: Is there anything else about TSUNAMI BLUE that you’d like readers to know? What can readers look forward to seeing from you in the future? GAW: I only hope that readers find the world of TSUNAMI BLUE intriguing and exciting to read. It is a fast paced story that doesn’t let up until you have reached, THE END. And with Runners around every bend, I guess that’s the way it should be. And I do have some fun news. This just in, there will indeed be a second novel set in the TSUNAMI BLUE world. 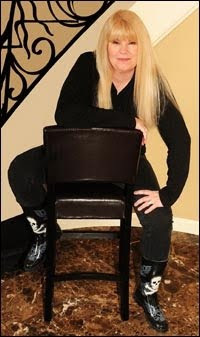 Out from Dorchester Publishing in March of 2011, the second book will feature new characters. But don’t be surprised if Blue and Gabriel make an appearance somewhere along the way. And I can’t say much, but I will say this. . .the deadly waves have calmed, but the winds are starting to whisper. . . Thank you, Heather for having me. It is always so much fun here at the amazing Galaxy Express. Ms. Williams, congratulations on the sale! Thanks for your time, your exclusive news, and for your art! Now for the giveaway details: To enter for a chance to win a copy of TSUNAMI BLUE, leave a comment for this post (contest limited to U.S. residents). Two winners will be chosen. The deadline to enter is 6 p.m. EST on Sunday, April 4, 2010. Share your favorite espresso drink recipe or post-apocalyptic story. Or both!